I have long held that for a boat builder to be successful over the long run they must identify a specific target market and produce a limited product specifically intended for that market. Contrary to this wisdom, for many years, Bristol Yachts seemed to try to build a boat for just about everyone. In the 20 years between 1968 and 1988, Bristol produced at least 28 different models of sailboats from 19’ to 65’, plus a motorsailer and a trawler. Over one short period, they offered six different models of sailboats in the 27’ to 30’ size range. This represents enormous tooling cost for a small builder to support and it is no wonder Bristol has had its share of difficulties over the years. In recent years, Bristol seems to have set a clear sight on the mid-sized, higher quality, cruising sailboat market yet they survived for decades offering an incredible variety of product. What do I know? If I were that smart, I’d be running a boat building company rather than trying to make a living as a marine surveyor and boat designer. The Bristol 29.9 was designed by Halsey Herreshoff, grandson of the famous Captain Nat Herreshoff. 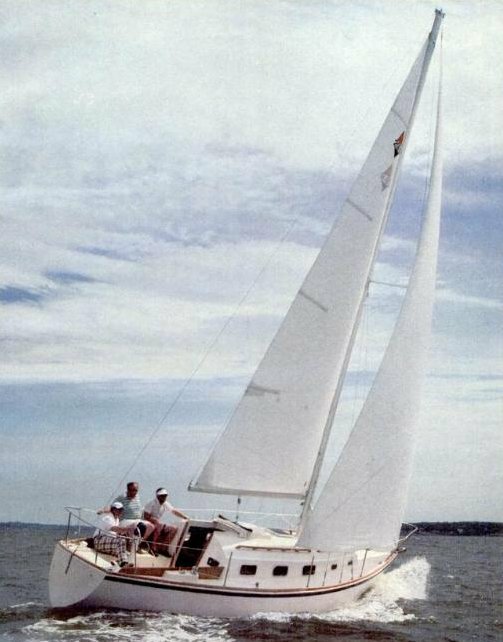 The model was introduced in 1978, remained in production until 1987 and was available as a centerboard model with a board up draft of 3’ 6" or a standard keel model with a draft of 4’ 4". Construction of the 29.9 is quite straightforward with a hull lay-up of solid fiberglass and resin with balsa core in the decks for strength, rigidity, and weight reduction. The hull and deck are joined on an inward hull flange with stainless steel nuts, bolts and washers closely spaced. The hull is strengthened by full and partial bulkheads that are neatly and securely fiberglassed in place. Generally, this is a solidly built boat of better than average quality. Bristol does not make much use of fiberglass liner so most attachments and structural members are visible for inspection, and we seldom find significant problems. Osmotic blistering is sometimes noted but is seldom significant and certainly not unique to the Bristol in this age range. Originally the 29.9 was powered by the venerable Atomic 4 gasoline engine which, if properly maintained, should still be serviceable. Later models were powered by a 15 hp Yanmar which gave way to the 16 hp Universal diesel in 1983. Both of these engines are right on the edge of my 2 hp per 1,000 lbs of displacement rule of thumb, although they seem to provide adequate performance under most conditions. There were two cabin arrangement plans for the 29.9 with the difference being an almost imperceptible change in the galley arrangement. This is a classic arrangement with V-berths forward followed by an athwart ship head, opposing settees in the main saloon and a quarter berth and galley aft. The reason this arrangement has been so popular for so many years is that it works. The only drawback of the plan is that crew must pass through the head to get in and out of the V-berth unless you crawl through the forward deck hatch. With an over all length of 29’ 11" it seems clear the MORC racing rule was at least a consideration in this design, although other features seem to suggest a stronger cruising influence. The 8,650 lb. displacement of the 29.9 is considerably heavier, and sail area is less than average of competitive MORC boats of the time. I must admit that the 29.9 is not a boat I have sailed much other than an occasional sea trial. However, owners report a well mannered boat and general satisfaction with her speed and performance. There is a large rudder that provides a responsive helm and a good sized skeg forward of the rudder for good directional control and to aid in keeping those pesky crab pots off the propeller. I would expect that, with a ballast/displacement ratio of 42%, a relatively wide beam of 10’ 2" and a conservative sail/displacement ratio of 14.8, this is a boat that would stand up to a blow quite well. 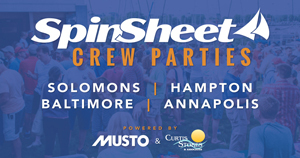 On the other hand, we sail here on the Chesapeake where summertime winds are often light. I would think a good light air number one genoa would be essential equipment around here. The 29.9 was in production until 1987 when Bristol dropped the model from its line. This 10-year production run of over 200 boats is considered a very successful model by most builders of boats in this size range. Bristol remains a popular choice of cruising sailors looking for traditional quality and construction, and prices generally reflect their popularity.